← Flying for Food: The Airport Grille @ KEWB! In my eyes a town without an airstrip doesn’t make sense… Maybe people don’t agree, but imagine a coastal city (or town) like Boston, MA, Tampa Bay, FL or San Diego, CA without so much as a boat ramp and dock, let alone a port of any kind. You might ask how cities like this, with such “prime” placements could forgo access to the ocean. Well, when I see a town without an airport, I feel a similar way! Each community has access to the sky and the National Airspace System, why not take advantage of it? Granted only so many communities have access to waterways and oceans, but those that do should take advantage of it. In places where airports are scarce an widely spread, I often wonder why a new airport is not even considered… These communities are missing out on an opportunity for a new type of industry and a new group of businesses! I am not naive to think there are no barriers to a new airport, there are a great deal, but there are also great opportunities as well! That said, many communities have airports, some are thriving, others are getting by and some are struggling, but together these airports provide a vital service to the aviation community, the flying public and the general public! 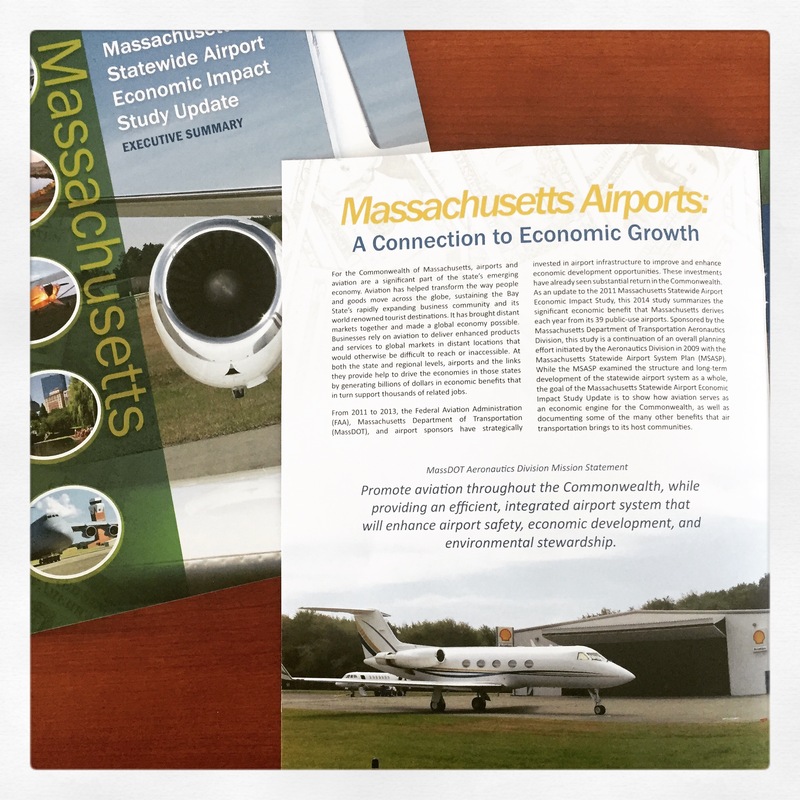 Along comes 2014 and a 9-month data gathering effort led by MassDOT Aeronautics, and in early 2015 we have a statewide economic impact study UPDATE! The update highlighted growth in all of the major metrics that Massachusetts had selected to highlight back in 2011. Great news to help show why airports are VITAL for their sponsor communities! So let’s take a look at the numbers and what they mean… The three major metrics are JOBS, PAYROLL and OUTPUT. Jobs – The number of jobs at the airport, both direct and indirect. A direct job would be an airport operations officer or aircraft mechanic. This includes aviation related positions as well as temporary jobs created by capital projects. Payroll – The annual payroll for employees, both public and private, that are employed at the airport. Output – This is the BIG one, representing the economic output of the airport, in other words, this is the value of the airport to the local sponsor community. This is the number of economic impact that would not exist if it were not for the airport existing. Whether it is the sale of fuel or an airport business employee stopping at the pharmacy before leaving town to head home, any economic activity because of the airport is the economic output of the airport. This figure is determined by the combination of direct, indirect and induced (the last two of which are multiplier impacts). This means that over the 3-4 years between the study and the update study Massachusetts saw some significant gains… As the aviation community grows stronger and works to rebound following tough years during the late 2000’s and early 2010’s, these figures show that aviation really is growing in Massachusetts! Between the initial study and the update, there were 37,887 added jobs related to aviation in the Commonwealth. This related directly to an increase in payroll of $1.2 billion for local workers. This is all in addition to the growth in economic output activity of $4.7 billion. The recent study update shows growth across the state, but it also shows the real value of airports. Just because our airports exist the Massachusetts economy benefits, so what’s the value of an airport? Well, it’s a pretty big deal! Take my home airport for example, the results for which were highlighted in a local news story, which received national attention! The New Bedford Regional Airport is responsible for 297 jobs, which is up from 234 (2011 study), a payroll of $10.6 million and most importantly, an economic output of $32.4 million. Both the payroll and economic output/impact are also both up significantly from the 2011 study… Read another way, the local economy in New Bedford receives a $32.4 million infusion annually just because the airport exists! When looked at that way, it is easy to see how an airport benefits a local community.